Summary. During the past three decades, the deleterious consequences of Chornobyl accident including carcinogenic effects in the people who were accidentally exposed to radiation have been intensively studied. In particular, recent studies provided increased knowledge of the molecular pathogenesis of thyroid tumors in children exposed to Chornobyl fallout. The risk of several forms of leukemia including myelodysplastic syndromes is elevated in Chornobyl liquidators. Furthermore, the upward trends of increases in a variety of other tumors including breast cancer, cancers of central nervous system and renal cancer have been reported in the persons exposed to Chornobyl fallout. There is growing evidence that insufficient apoptosis allows irradiated cells to survive and thereby contributes to carcinogenesis. The purpose of the present survey is to summarize the recent findings related to apoptotic biomarkers among cancer patients from the different populations affected by the Chornobyl catastrophe. Among the particularly radiosensitive cancer sites, we focused on thyroid cancer and leukemia. Several genes and/or proteins controlling apoptosis directly or indirectly have been incorporated into the analysis. The data reviewed here provide a mechanistic link between the apoptosis alterations and development of radiation-related cancer in the 30-year post-Chornobyl period. We suggest that the type of mutations arising from misrepair of DNA double strand breaks (gene fusion and amplification) is the initial signature event in radiation-induced thyroid cancer. Much work has to be done over the next years to elucidate central questions related to the nature of human radiation carcinogenesis. This article is part of a Special Issue entitled “The Chornobyl Nuclear Accident: Thirty Years After”. Abbreviations used: ALL — acute lymphoblastic leukemia; AML — acute myeloid leukemia; APAF-1 — apoptotic peptidase activating factor 1; cFLIP — cellular FLICE-like inhibitory protein; CLL — chronic lymphocytic leukemia; CML — chronic myeloid leukemia; DIABLO — direct IAP-binding protein with low PI; DISC — death-inducing signaling complex; ERR — excess relative risk; FADD — Fas-associated protein with Death Domain; GC — gastric cancer; HTRA2 — high temperature requirement protein A2; IAPs — inhibitor of apoptosis proteins; KEGG — Kyoto Encyclopedia of Genes and Genomes; LSS — Life Span Study; MDS — myelodysplastic syndromes; miRNA, miR — microRNA; MM — multiple myeloma; MOMP — mitochondrial outer membrane permeabilization; SIR — standardized incidence ratio. On April 26, 2016 the world marked 30 years since the Chornobyl nuclear power plant accident in Ukraine — the disaster that affected millions of people of all ages in Belarus, Ukraine, and the Russian Federation as well as vast areas of Europe and the northern hemisphere [1–4]. In 2006, the International Atomic Energy Agency classified the Chornobyl accident as “the greatest nuclear catastrophe in human history” ; a perception that remains valid even when considered the atomic bombings in Hiroshima and Nagasaki. In addition to the scale, the radiation exposure from Chornobyl fallout differed from that from the atomic bombs; respectively, protracted/low dose vs. acute high dose/dose rate, mixed α + β + γ radiation vs. mostly γ + n, mostly internal vs. mostly external exposure, patchy vs. uniform spread of radioactivity, and the size of exposed population > 107 vs. ~ 105. Technical aspects of the Chornobyl nuclear power plant accident and radioactive releases have been thoroughly described in a number of publications [1–3] but a short account is given here to help to appreciate the radiological impact. Briefly, human error during experimental operation and some reactor design flaws led to catastrophic overheating of the fuel and thermal destruction of the primary coolant system. The combination of these factors resulted in at least one (steam) explosion that dispersed reactor debris and ignition of graphite moderators. Radionuclides released from the steam explosion included very short lived fission products (half-lives in the order of seconds and minutes), which resulted in very high dose rates immediately around the reactor site. After the initial release, further releases of radionuclides occurred over another10 days due to the graphite fire; Table 1 lists selected radionuclides released due to the Chornobyl accident . Radioactive emission from the reactor moved with prevailing winds and spread in a spotty pattern over the territories of several countries. Heavy rainfalls exacerbated radioactive fallout resulting in the contamination of groundwater and soil. Active emission into the atmosphere ceased after a sarcophagus around the destroyed reactor was completed in November 1986 . Referring to Table 1, the main nuclides of concern for the dose received by the exposed population are iodine-131, cesium-137, cesium-134, strontium-90. The release of radioactive iodine isotopes (iodine-131 and -133) was of immediate significance in the first few weeks after the accident, but became less significant over time, given their short half-lives. Cesium-137 will continue to be the most significant radionuclide, as far as exposure to radiation is concerned. The nuclear fuel particles, strontium-90, plutonium-241, and α-emitting actinides (not listed in Table 1) were deposited at high concentration within about a 20-km zone around the reactor. Plutonium-241 decays to americium-241 which, in turn, decays by α emission with a by-product of γ-rays. The total activity of americium-241 in the environment will reach a maximum in the year 2058 after which will slowly decline. Note: *radiation doses to tissue are expressed in terms of absorbed dose in units of Gray (Gy) while doses to the whole body from external and internal irradiation are expressed in terms of the weighted quantity, effective dose, in units of Sievert (Sv). The major Chornobyl-affected groups represent registered accident recovery workers, evacuees, children and adults from areas contaminated by radionuclides (Table 2). Among 530,000 workers who were engaged in recovery operations (“liquidators”; the official term used in the former Soviet Union) the individuals who took part in the activities in 1986–1987 received the highest whole body effective doses exceeding 500 mSv [2, 3]. The average internal dose to the thyroid of liquidators was 0.21 Gy. It has been difficult to confirm the validity of the results that have been reported for a variety reasons, including lack of dosimetry equipment for measuring mixed α + β + γ fields . About 270,000 people continue to live in strictly controlled areas where cesium-137 contamination in soil exceeds 555 kBq/m2. This review will focus on apoptotic markers in cancer patients from the above-mentioned groups affected by the Chornobyl catastrophe. There is a long history of a link between exposure to ionizing radiation and an elevated incidence of cancer . Ionizing radiation is defined as electromagnetic radiation (e.g., γ-rays) or particulate radiation (e.g., electrons or α-particles) that has sufficient energy to remove electrons from molecules (e.g., DNA) and their local environment. Free electrons, in turn, can damage human cells. If cellular damage is not fully and perfectly repaired, it may result in cell death, or it may result in a viable but modified cell that retains molecular alterations as a legacy of radiation exposure. The two outcomes have different health consequences for individuals whose cells were damaged by ionizing radiation. Cell death results in the loss of tissue function if a sufficiently large number of cells have been eliminated; illustrative examples include acute radiation syndrome, microcephaly, and growth and mental retardation in the children of mothers exposed to radiation. However, if the irradiated cell remains viable but modified at molecular and biochemical levels, the health consequence of primary concerns is the induction of cancer. Leukemia and cancer of the thyroid, lung, and breast have been consistently associated with ionizing radiation exposure . Cancer induction is a stochastic or probabilistic (random) process. This means, as Eric Hall put it, that “a cancer induced by 1 Gy is no worse than one induced by 0.1 Gy”, but “of course the probability of its induction is increased” . Epidemiological studies generally show that (i) the probability of solid cancer induction, or risk, increases linearly with increasing radiation dose with no dose threshold (a linear-quadratic relationship between dose and risk for leukemia) , and (ii) exposure to ionizing radiation can lead to the age-/time-dependent development of a wide range of tumors that are indistinguishable from those arising spontaneously in nonirradiated populations ; studies with animal and cellular model systems provide essentially the same message . Thus it could be concluded that the process of cancer development after ionizing radiation largely mirrors the process of spontaneous carcinogenesis. Over the last decade, sequencing of more than 22,000 cancers revealed more than 3,000,000 alterations in malignant tumors [10–14]. A systematic analysis of these genetic alterations has advanced our understanding of the relationship between genotype (genetic susceptibility and somatic mutations) and phenotype (tumor development and growth) [13, 14]. As discussed later, similar multilevel integrated approaches have been used to identify alterations that could be characteristic of radiation exposure from the Chornobyl radioactive fallout. The current paradigm in cancer biology is that carcinogenesis is a multistage process. The implication is that several distinct events separated in time are required to complete the long march toward tumorigenesis [15–18]. This idea is now more than 70 years old and is exemplified by the skin cancer experiments in mice that introduced the concepts of initiation, promotion, and progression as stages of tumor development . Within the framework of the initiation-promotion-progression model, ionizing radiation is assumed to act as an initiating agent [7, 8]. The discovery of DNA as the molecular carrier of heredity  led to the hypothesis that cancers are abnormal clones of cells characterized by and caused by abnormalities in hereditary material that originated from a single aberrant cell . This hypothesis is supported by the demonstration that (i) transfer of the total DNA isolated from human cancers into phenotypically normal cells can convert them into cancer cells [22, 23], and (ii) agents that damage DNA and generate gene and chromosomal mutations in somatic cells also cause cancer . There is a weight of evidence that ionizing radiation is responsible for DNA double-strand breaks resulting in the changes biologically relevant for initiation of carcinogenesis . Putative changes observed in cancers include among others chromosome rearrangements, such as translocations including formation of chimeric genes  and gene amplifications [26–28], all associated with etiology of Chornobyl fallout-associated hematopoietic and pediatric thyroid malignancies. Chromosome rearrangements contribute to tumorigenesis by altering the dosage of oncogenes and tumor suppressor genes . Specifically, translocations generally fuse two genes to create an oncogene or can inactivate a tumor suppressor gene by truncating it or by separating it from its promoter. Amplifications usually contain an oncogene whose gene product is abnormally active because the tumor contains 10 to 100 copies of the gene per cell, compared with the two copies present in normal cells. Gain and loss of chromosomal material in neoplastic cell populations is considered to be a process of diversification that leads to the survival of the fittest clones . Such cells are thought to lose any cellular function that has proved to be non-essential for their viability, that is, does not increase their cellular fitness [17, 18, 21, 30]. For example, cells displaying a fitness phenotype tolerate progressive chromosomal instability, tolerate metabolic stress, glucose deprivation, hypoxia, oxidative stress in microenvironment, tolerate mistakes while replicating DNA or during division, and abrogate checkpoints which exist to slow down their growth or make them to commit suicide (apoptosis) under such circumstances [13, 16, 30, 31]. Apoptosis is the most investigated mode of regulated cell death and is characterized by a highly ordered cellular destruction in response to internal and/or external stimuli. Apoptotic cell death is distinguished by unique morphological and biochemical characteri­stics. According to the functional classification of cell death subroutines proposed by the Nomenclature Committee on Cell Death (2012), four major modes of apoptotic cell death could be delineated: (i) extrinsic apoptosis by death receptors; (ii) extrinsic apoptosis by dependence receptors; (iii) caspase-dependent intrinsic apoptosis; and (iv) caspase-independent intrinsic apoptosis . Receptor-dependent apoptosis is mediated by death receptors (TNFR-1, Fas, TRAIL-R1, TRAIL-R2)  or dependence receptors (DCC, UNC5, Patched, TrkC, and others) , representing cell surface transmembrane proteins. Upon the binding of death ligands to their respective death receptors dynamic multiprotein complex known as death-inducing signaling complex (DISC) is assembled. Besides death receptors, DISC comprise the adaptor Fas-associated protein with death domain (FADD), pro-caspase-8 (or -10), and the cellular FLICE-like inhibitory protein (cFLIP) . On recruitment to the DISC, the pro-caspase-8 (or pro-caspase-10) forms homodimers resulting to caspase activation at the DISC. Activated caspase-8 then initiates the caspase cascade by cleaving downstream effector caspases or the BH3 interacting domain death agonist (BID) that ultimately leads to apoptosis. Mechanisms of apoptosis induction mediated by dependence receptors or death receptors are principally different. Moreover, proapoptotic signaling pathways are not similar for various dependence receptors . For example, in the absence of its ligand Sonic Hedgehog, the dependence receptor Patched triggers apoptosis through ubiquitination (by E3 ubiquitin ligase NEDD4) and activation of initiator caspase-9 . The caspase-dependent intrinsic pathway is activated following cellular stress, which results in mitochondrial outer membrane permeabilization (MOMP) facilitating the release of pro-apoptotic proteins from the mitochondrial inner membrane space into the cytosol. In particular, cytosolic cytochrome c triggers the oligomerization of apoptotic peptidase activating factor 1 (APAF-1), which recruits pro-caspase-9 into the apoptosome, the activation platform for caspase-9. Active caspase-9 then directly cleaves and activates effector caspases-3 and -7, resulting in cleavage of many vital cellular proteins and subsequent apoptosis. Caspase-independent mechanisms of cell death may be initiated by active (e.g., apoptosis-inducing factor) or passive (e.g., ATP depletion) mechanism. The active initiation of apoptosis-associated DNA fragmentation is mediated by translocation of apoptosis-inducing factor and endonuclease G to the nucleus following MOMP . Mitochondrial high temperature requirement protein A2 (HTRA2) possessing serine protease activity also plays as direct effector of caspase-independent apoptosis . Other known players of caspase-independent apoptosis are lysosomal cathepsins. After translocation into the cytosol following lysosomal membrane permeabilization cathepsins process their substrates to promote apoptotic signaling . In addition to their involvement in caspase-independent cell death, cathepsins can also directly digest and activate caspases. It is noteworthy that the release of apoptosis-related proteins from mitochondria upon both caspase-dependent and -independent apoptosis is regulated by the BCL-2 protein family composed of one antiapoptotic (BCL-2, BCL-XL, BCL-W, MCL-1, and A1) and three proapoptotic (effectors such as BAX, BAK, BOK; activators such as BID, BIM, PUMA; and sensitizers such as BAD, BIK, NOXA, HRK, BNIP3, and BMF) subgroups [38, 39]; in addition to its activity as a sensitizer, NOXA can also act as an activator protein . The functional balance between prosurvival and proapoptotic members of the BCL-2 family of proteins determines the fate of a cell. Furthermore, caspase activation and function are controlled by the inhibitor of apoptosis proteins (IAPs)  that in turn can be antagonized by mitochondrial proteins HTRA2 and direct IAP-binding protein with low PI (DIABLO) upon their translocation to the cytosol caused by apoptotic stimulus . The cellular tumor antigen p53 is one of key regulators of the cellular response to DNA damage, hypoxia, nutrient deficiency, and many other cytotoxic stresses, including ionizing radiation. In response to cell stress signal, p53 induces cell-cycle arrest, senescence (loss of proliferative potential) or apoptosis. To date, the p53-mediated apoptotic pathways functioning in both transcription-dependent and -independent manner are well established (for review, see ). Given that molecular network responsible for regulating and exe­cuting apoptosis consists of plethora of the specific components (around 300 genes in mammals ), any of them could be represented as a candidate apoptosis marker. Moreover, the expression of each gene enco­ding an apoptotic protein might be regulated by long and short non-coding RNAs. The involvement of long non-coding RNAs and microRNAs (miRNAs) in apoptosis has been intensively explored [43, 44]. Because resistance to apoptotic cell death is a hallmark of cancers [17, 18], the identification of apoptosis biomarkers has become an interesting topic in cancer research. The major alterations in both receptor-dependent and -independent apoptotic pathways, which are believed to play a significant role in tumorigenesis and resistance to anticancer treatment, are depicted in Fig. 1. A large body of clinical data indicates that certain apoptosis-related genes and/or proteins may be useful for early and differential diagnosis, prognosis, and treatment response to specific therapies [46–52]. Several most promising apoptosis markers in post-Chornobyl cancers will be discussed in the following sections. The accident in the Chornobyl nuclear power plant in 1986 has been shown to lead to excessive numbers of thyroid cancers among children exposed to the radioactive fallout [2–5]. Clear dose dependence of childhood thyroid cancers has proven that radiation exposure is the primary cause of thyroid cancer induction [53–55]. This is supported further by: (i) the temporal patterns in terms of age and time after exposure; namely, the increase started to appear 4–5 years after the accident in children born before but not after the accident, and no increase was observed in exposed adults (i.e. liquidators and individuals who lived in areas of high contamination); (ii) Chornobyl-related dose response for thyroid cancer is similar to that described for atomic bomb survivors and individuals who have received medical irradiation to the thymus and face . As of June 2016, a causal effect of the Fukushima Daichi nuclear power plant accident on thyroid cancer incidence in the Japanese children is debatable five years after the accident [57, 58]. Referring to Table 2, relatively short-lived iodi­ne-131 and iodine-133 were the main contributors to the internal radiation exposure to the thyroid within a few weeks after the accident. Since 1987, ionizing radiation exposure was due to cesium-137 and -134 and strontium-90 incorporation in foodstuffs (milk, meat, potatoes, root vegetables, wild mushrooms, berries, etc.) as well as inhalation of aerosols containing radioactive plutonium and other actinides [3–6]. The Chornobyl childhood thyroid cancer studies provide unique insights into the molecular mechanisms of radiation-induced carcinogenesis because (i) the compendium of genetic alterations in spontaneous thyroid cancers by the Cancer Genome Atlas (TCGA) project  provides a ready framework of reference for genetic alterations in radiation-induced thyroid cancers; (ii) epidemiological, radiobiological, genetic, and dosimetric data can be integrated for individual cohorts [53, 55, 60, 61]; (iii) the observed high incidence of the disease in pediatric patients who lived in the Chornobyl fallout areas could be attributed to radiation exposure because of low background of spontaneous disease [59, 62]; (iv) it is an excellent in situ model of radiation-induced carcinoma owing to the fact that most thyroid cancers (except medullary carcinoma) originate from unicellular follicular epithelium of normal thyroid (there are no corresponding in vitro neoplastic transformation assays; for example ; radiation-induced carcinomas predominate over sarcomas ). In 1987, Fusco et al. identified the first human oncogene associated with thyroid cancer  using DNA transfection analysis on immortalized rodent cells . Of note, the patient who donated thyroid tissue samples for the analysis had been accidentally exposed to a high dose of ionizing radiation seven years before diagnosis of thyroid malignancy. It had been established later that the transforming gene is an activated the RET proto-oncogene . The RET gene codes for a cell membrane receptor tyrosine kinase . In papillary thyroid carcinoma, RET is activated via chromosomal rearrangements, which results in fusion of the intracellular tyrosine kinase domain of RET and portions of various genes, creating the family of chimeric proteins termed RET/PTC. Table 3 lists RET-fused and other gene rearrangements involving BRAF, NTRK, and PPARγ in thyroid carcinoma after Chorno­byl [62, 67–76]. As discussed later, these rearrangements may cause both the gain of oncogenic functions of RET, BRAF, NTRK, and PPARγ and the knockout of the tumor suppressor function of partner genes. Note: amp(*) — amplification; ATM — ataxia telangiectasia mutated (ATM serine/threonine kinase); BRAF — B-Raf protooncogene (serine/threonine kinase); ER — endoplasmic reticulum; inv(*) — intrachromosomal inversion; MAPK — mitogen-activated protein kinase; NTRK — neurotropic receptor tyrosine kinase; PPARγ — peroxisome proliferator activated receptor gamma; PTC — papillary thyroid cancer; RET — rearranged during transfection; t(*;*) — interchromosomal translocation. The fused forms of RET involving CCDC6 (PTC1) or NCOA4 (PTC3 and PTC4) are considered the genetic markers of childhood thyroid carcinoma associated with exposure to ionizing radiation [60–62]. For example, in a series of 59 post-operative thyroid carcinomas obtained from the children in Belarus during the first post-Chornobyl decade, 72% tumors analyzed had this type of RET arrangements compared to 20% RET/PTC fusions in non-irradiated populations. Although radiogenic origin for these thyroid cancers has been questioned [62, 77–80], the high degree of specificity of gene rearrangements catalogued in Table 3 strongly argues otherwise. Mechanistically, nonrandom and simultaneous breakage of participating genes as well as their recombination vs. randomness of ionizing radiation-induced DNA double strand breaks is quite plausible when tissue-specific architecture of nuclear chromatin is taken into account . A more interesting aspect, however, is an indication of the molecular mechanisms of the initiating radiation effects [8, 25, 81]. This possibility is nicely illustrated by the observation that experimental overexpression of RET/PTC1 or RET/PTC3 oncogenes in thyroid follicular cells is insufficient alone to induce a full-blown thyroid cancer, unless anti-death and proliferation programs are also activated [82, 83]. Finally, some rearranged forms in Table 3 define molecular subtypes of the Chornobyl fallout-induced thyroid cancers; specifically, RET and NTRK fusions characterize a subset of papillary thyroid carcinoma [61, 67, 70], while PAX8/PPARγ fusions characterize subset of follicular thyroid carcinoma [62, 67, 68]. As reported [80, 84–86], a radiation-specific DNA copy number gain of chromosome 7 band q11 and mRNA overexpression of the CLIP2 (CAP-Gly domain containing linker protein 2) gene located within the amplified band are novel potential markers of radiation exposure in post-Chornobyl thyroid carcinomas in Ukrainian and Russian children . As in the case of chromosomal aberrations , the gene amplification is a consequence of misrepair of ionizing radiation-induced DNA double strand breaks [27, 28]. Copy number alterations, present in 33% of radiation-exposed cases and absent in all non-exposed cases , suggest a strong correlation with the tumor causality [83, 84]. However, CLIP2 amplification in the exposed vs. non-exposed groups coexists with RET rearrangements ; thus, rather than having a stand-alone role, CLIP2 may contribute to the thyroid cancer development in concert with other changes in the genome that enhance or inhibit some aspects of carcinogenesis, e.g., the ability of initiated cells to bypass or disable the apoptotic machinery . A role in apoptosis for the rearranged genes is complex because both functions of genes that form fusion and functions of partners with which they fuse may be affected [89, 90]. Several observations indicate that the transforming potential of fusion genes is not limited to the kinase activation. In fact, the normal cellular function of each respective fusion partner that contributes to a fusion protein is severely disrupted (Table 3 based on data in [91, 92]). Full-length wild-type CCDC6 (coiled-coil domain containing protein 6) is a pro-apoptotic phosphoprotein that negatively regulates CREB1-dependent transcription and as a substrate of ATM serine/threonine kinase is responsive to ionizing radiation-induced DNA damage (the first neighborhood network  of wild type CCDC6 is shown in Fig. 2). However, a truncated form corresponding to the fragment included in the RET/PTC1 fusion gene promotes cell survival . In addition, expression of a truncated CCDC6 may act as a dominant, negative inhibitor of the wild-type CCDC6 protein, thus inhibiting apoptosis . Further, Merolla and co-workers [95, 96] demonstrated that CCDC6 deficiency in cancers that carry CCDC6 fusion affects ATM-, p53- and PP4-mediated responses to DNA damage, specifically the γH2AX foci formation, repair of DNA double-strand breaks, and integrity of the G2/M checkpoint thereby allowing the cell to enter mitosis with DNA damage. Similarly, PRKAR1A and the TRIM gene family which contribute to RET/PTC2, RET/PTC6 and RET/PTC7 (Table 3), normally act as cancer suppressors, a function likely to be abrogated by their disruption during fusion gene generation. The wild-type TRIM24 protein in collaboration with TRIM33 is involved in p53-regulated pathways such as apoptosis and the DNA damage response as well as transcription regulation via core histone modification and binding . By inference, these pathways may become deregulated which enhances the opportunity to destabilize the genome [13, 14, 16, 17]. Fig. 2. The CCDC6 regulatory network. ATM — ataxia telangiectasia mutated (ATM serine/threonine kinase); CREB1 — cAMP-responsive element-binding protein 1; MAPK — mitogen-activated protein kinase; PP4C –protein phosphatase 4 catalytic subunit. An apoptotic footprint has been seen in some studies of the molecular pathology of thyroid cancer. Dinets et al. searched for markers of proliferation and apoptosis in a cohort of 70 Ukrainian adult thyroid cancer patients exposed to the radioactive fallout from the Chornobyl accident during their childhood (all patients were 18 years of age or younger in 1986 and diagnosed between 2004–2008). The BCL2 protein was found to be overexpressed by immunochemistry in 90% papilloma thyroid cancers suggesting anti-apoptotic signaling in the tumors carrying the BRAF point mutations (T → A at position 1799, also called V600E), associated with non-radiogenic etiology [58, 62, 78]. A similar increase in BCL2 mRNA expression has been observed among 15 differentially expressed genes between radiation-induced and sporadic papilloma thyroid cancer in Ukrainian patients , also analyzed by Dinets and colleagues . Independently, Xu et al. applied a machine learning method to re-examine the previously published transcriptome data  in order to identify a diagnostic marker of thyroid cancers. According to the authors, the overexpression of BCL2 at mRNA level is the most statistically significant among a nine gene-signature that discriminates between thyroid cancers and the normal thyroid . It would seem then the BCL2 overexpression may serve as a diagnostic marker but not a marker of the post-Chornobyl thyroid cancers. Several groups studied gene expression profiles (for example [86,102–104]) in biological samples from the Chernobyl Tissue Bank . While the authors generally reported “subtle, but significant differences in gene expression”  between Chornobyl radiation-exposed vs. sporadic groups, there was no overlap of genes among different studies. An interesting result in  is differential transcriptional signaling related to proliferation and apoptosis between radiation-exposed and non-exposed normal thyroid tissues. An imbalance between cell death and growth favoring the latter is one of hallmarks of cancer . Dom and co-workers  used the Kyoto Encyclopedia of Genes and Genomes (KEGG) database  to classify differentially expressed genes into their respective functional pathways. Two of eleven KEGG pathways, hsa04210 and hsa04010, respectively, regulate apoptosis and proliferation via the MAPK signaling pathway . The authors associate the activation of these pathways to global late effects of β-radiation (Table 1) on the normal thyroid epithelium. However, the MAPK and apoptotic pathways are known to be significantly deregulated in the Chornobyl thyroid cancers by genetic alterations, such as the formation of kinase fusion oncogenes, RETPTC and ETV6/NTRK3, and copy number gain and resulting overexpression of CLIP2 (Table 3). The CLIP2 first neighborhood network includes the anti-apoptotic BAG2 gene (BCL2-associated athanogene) , whose anti-cell death activity may be enhanced by the amplification of CLIP2 in RET/PTC-positive thyroid cancers [80, 84, 85]. The other CLIP2 partner in the network is neuralized E3 ubiquitin protein ligase 1 (NEURL1), which has a pro-apoptotic activity via the NOTCH1 signaling pathway which itself is activated by the MAPK signaling pathway [107,108]. As discussed earlier, cancer cells evolved to tolerate multi-level abnormalities (translocations, misrepaired DNA damage, etc.) favoring survival and proliferation because these defects drive the carcinogenic process. In contrast, normal cells are programmed to commit suicide (apoptosis) in response to such abnormalities, perhaps as a protective mechanism against cancer. Dom et al. findings seem to be at odds with these established concepts at least as applied to Chornobyl fallout thyroid carcinogenesis. The possible leukemogenic effects of X-rays were recognized more than a century ago (for review, see ). To date, there are several statistically valid epidemiological studies estimating radiogenic risks for hematological cancer incidence and mortality. In particular, it was shown that both acute and protracted ionizing radiation exposures among the Japanese A-bomb survivors (Life Span Study (LSS) cohort)  and the Techa River cohort (28,223 persons)  were associated with increased incidence rates for leukemia and other hematological malignances. In addition, leukemia mortality risks among workers at the Mayak nuclear complex (about 21,500 persons) and 90,268 US radiological technologists were also well documented [112, 113]. The LSS with 93,741 survivors of A-bombing and 26,580 non-exposed Hiroshima and Nagasaki residents represents one of the largest epidemiological study of radiation-exposed population with long-term follow-up (since 1950) with most informative data on personal dose estimates. The overall conclusions from analyses of hematological malignancies in the LSS cohort can be summarized as follows: (i) radiation-induced leukemia occurred 2 to 3 years after exposure, reached its peak within 6 to 8 years after the bombing, and then declined steadily; (ii) while leukemia accounts for only about 3% of all cancer deaths in the LSS, it represents more than 20% of the excess cancer deaths (between 1950 and 1990); (iii) for those exposed as children essentially all of the excess leukemia deaths appear to have been early in the follow-up; (iv) in contrast to solid cancers, the dose response for leukemias is nonlinear (see above); (v) the radiation-associated leukemia risks have decreased over time, however dose-related increased risks, especially for acute myeloid leukemia (AML), may persist for many years after ionizing radiation exposure; (vi) earlier findings of radiation-associated excess risk for multiple myeloma (MM) have not been confirmed [110, 114]. The incidence of leukemia and other hematological malignancies in the most exposed populations in Ukraine, the Russian Federation, and Belarus is among the major objectives of epidemiological stu­dies on the long-term effects of the Chornobyl accident. The joint Ukrainian-American study of leukemia and related disorders among Chornobyl cleanup workers based on the estimation of a cohort of 110,645 male workers demonstrated a significant positive association between leukemia incidence and continuous radiation dose (excess relative risk (ERR)/Gy = 1.26) . This case-control study has also identified elevated radiation risks among Ukrainian cleanup workers for both CLL and non-CLL cases (ERR/Gy = 2.58 and 2.21, respectively). For a long period of time, CLL was not considered as radiation-associated leukemia. However, in recent years this view has changed and now CLL radiogenicity is strongly suspected [116–119]. The excess risk of leukemia incidence for the period 1986–1997 in Russian cohort of the Chornobyl liquidators with doses above 150 mGy has been also found . Similarly, Rozhko et al. recently observed an increase of standardized incidence ratios (SIR; the ratio of the observed to the expected number of cancer cases) for acute lymphoblastic leukemia (ALL; SIR = 1.7), CLL (SIR = 1.4), and chronic myeloid leukemia (CML; SIR = 2.0) in a cohort of 99,693 cleanup workers from Belarus over the whole post-Chornobyl period. Of note, increased risks of leukemia among both Ukrainian and Russian cleanup workers were consistent with estimates for the Japanese atomic bomb victims [115, 120]. In addition, the significant excess of MM incidence (SIR = 1.61) in a cohort of 152,520 male Ukrainian Chornobyl liquidators in comparison with general population of Ukraine of corresponding age and gender has been recently identified . Another report has suggested that myelodysplastic syndromes (MDS) percentage in patients with hematological malignancies among Chornobyl cleanup workers (1986–1987) was higher than in the patients from the general population of Ukraine over the same period (5.4% vs. 3.7%) . In contrast to Chornobyl recovery workers, data on the leukemia incidence among the residents of the radioactively contaminated territories of Ukraine, the Russian Federation, and Belarus have been contradictory. For example, the risk for childhood leukemia was associated with the dose of ionizing radiation exposure in Ukraine and in Belarus but not in Russia . In two recent screening cohort studies in Ukraine and Belarus no convincing evidence of long-term risks of leukemia after exposure to Chornobyl fallout has been found [125, 126]. On the other hand, there are several reports indicating an increased incidence rates of leukemia among both children and adults living in the most heavily contaminated areas of Ukraine, the Russian Federation, and Belarus (reviewed in ), although statistical power of those data is unclear. As mentioned above, much interest in recent years has been focused on the search for molecular markers of cancer associated with ionizing radiation exposure. In particular, a number of apoptotic markers were investigated in leukemia and other hematological malignant diseases among persons exposed to radiation from Chornobyl fallout. It was found that leukemia cells in Chornobyl-affected AML cases more often overexpressed antiapoptotic BCL-2 (12/21 vs. 6/35; p < 0.05) and less often demonstrated expression of FAS death receptor (12/21 vs. 30/35; p < 0.05) . Moreover, BCL-2+/FAS– cells were found in four out of 21 ionizing radiation-exposed AML patients but in none of 35 AML cases with no history of irradiation. In a similar study, up-regulation of BCL-2 gene has been reported in Ukrainian patients diagnosed with leukemia in post-Chornobyl period . Because BCL-2 expression level in Ukrainian leukemia patients is superior to that of proapoptotic BAX, it is tempting to speculate that anti-death activity of BCL-2 may be responsible for the excessive accumulation of leukemia cells due to abnormal apoptosis. Further studies are needed to verify this hypothesis. It is well known that reciprocal translocation between chromosome 9 and chromosome 22 results in generation of the chimeric BCR-ABL gene detected in all CML cases and some acute leukemias. The BCR-ABL fusion protein is a constitutively activated tyrosine kinase with a variety of biological activities, including apoptosis inhibition. The anti-apoptotic function of BCR-ABL is mediated by increasing expression of Bcl-xL, preventing Bax and Bad translocation to mitochondria, and inhibiting APAF-1 binding to caspase-9 [130, 131]. Klymenko et al. assessed BCR-ABL status in interphase leukemia cells of 33 AML patients (13 Chornobyl radiation-exposed persons and 20 persons with spontaneous disease) by FISH analysis. Four BCR-ABL positive cases were found in AML patients among Chornobyl-affected persons, while only one such case was present in an unexposed group. Allelic polymorphism of the BCR gene in peripheral blood mononuclear cells from 36 Ukrainian Chornobyl cleanup workers with the total radiation doses in the range of 5.1–75.0 cGy was also studied using Southern blot hybridization . In 6 cases, an extra 8.3-kb fragment was detected in addition to the standard 4.3-kb HindIII fragment suggesting BCR rearrangement; also the presence of the BCR-ABL fusion gene was not assessed in that study. Such allelic polymorphism of the BCR gene has been never observed in healthy persons who were not exposed to ionizing radiation. Collectively, these data provide a new insight into the leukemia-associated genetic aberrations in Chornobyl cleanup workers long after irradiation and warrant further research. Telomeres were identified in classical genetics as specific DNA tandem repeats (TTAGGG)n, which cap the ends of chromosomes and protect cells against both unwanted fusion between chromosomes and apoptotic cell death. Exposure to ionizing radiation mainly at higher doses is known to modulate telomere length. However, the response of telomere length to protracted irradiation is still debatable and not fully conclusive. The effects of low-dose ionizing radiation on the telomere length and apoptosis rates in peripheral blood lymphocytes of 73 persons irradiated as a result of the Chornobyl accident were analyzed using flow-FISH assay and flow cytometry . The authors found a statistically significant telomere length decrease in a group of Chornobyl cleanup workers compared to healthy volunteers. It should be noted that apoptosis rates increased in lymphocytes with shorter telomeres. Since these changes persisted for 20 years post initial exposure, presented results point to the possible role for telomere length erosion in modulating apoptosis late after irradiation. In marked contrast, longer telomeres were found in patients with MDS developed after exposure to Chornobyl low-dose ionizing radiation . In those cases, elongation of telomere length was associated with decreased apoptosis induction. The telomere length modulation in Chornobyl accident recovery workers was recently examined by another research team . The results showed that the longest telomeres were observed in cleanup workers with malignancies. Furthermore, individuals with longer telomeres had almost twice the cancer risk compared to persons with shorter telomeres. Although these studies were limited, one way to interpret the above-mentioned data is that chronic low-dose ionizing radiation exposure might increase in vivo susceptibility to malignant transformation due to telomere lengthening. During the last decades, the novel apoptotic players such as highly conserved small non-protein coding single-stranded miRNAs (also called miRs) that display their effects by directly targeting both pro- and antiapoptotic genes have been extensively investigated. The disco­very of the relationship between miRNAs expression, ioni­zing radiation exposure, and tumor radioresistance has broadened the avenue in both radiobiology and cancer research (for review, see ). Although miRNA profiling among Chornobyl cleanup workers or among individuals inhabiting radioactively contaminated areas in post-Chornobyl period has not yet been performed, several other radiation exposed cohorts were under study. For example, the miRNA expression profiles were analyzed to elucidate the differentially expressed miRNAs in the high- or low-exposed atomic bomb survivors with gastric cancer (GC) . It was found that the expression levels of miR-21, miR-24, miR-34a, miR-106a, miR-143, and miR-145 were significantly higher in GC from high-exposed patients than in GC from low dose-exposed patients; but only miR-24 high expression was an independent marker for exposure status by multivariate analysis. Interes­tingly, proapoptotic BCL2L11 gene was recently verified as a direct functional target of miR-24 and downregulation of BCL2L11 mRNA results in cell growth promotion and apoptosis inhibition in GC . Another study focused on comparative analysis of miRNA expression profiles in whole blood samples collected from Mayak workers occupationally exposed to prolonged radiation or unexposed individuals . As a result, 45 differentially expressed miRNAs were identified, among which were several miRNAs (e.g., miR-21, miR-145, miR-199a, and miR-378) responsible for apoptosis regulation. Recent functional in vitro studies  provide evidence that sub-G1 apoptotic fraction of radioresistant cancer cells increased markedly after irradiation as a result of miR-21 knockdown. Overall, potential association of specific miRNAs expression with radiation-induced cancer merits further consideration. The Chornobyl accident is a man-made disaster of unparalleled proportions in terms of the magnitude of the radioactive releases and the size of the exposed populations. The exposed populations that received radiation doses include emergency and recovery operation workers and the general population that either evacuated from the areas in the vicinity of Chornobyl shortly after the accident or continued living in the contaminated areas of Belarus, the Russian Federation, and Ukraine. The radiological consequences of the Chornobyl accident on health of the exposed populations have been subject of numerous experimental and analytical studies in the past 30 years. These studies provided important new information on links between internal or external exposure to radiation in childhood or adulthood and cancer outbreak, and have been reviewed here. Our particular focus has been an overview of cytogenetic and molecular research of Chornobyl thyroid cancer and hematopoietic malignancies wherein cancer epidemiology provided the clear quantitative relationship between radiation dose and cancer risk for identifiable groups of exposed individuals (Table 4). We highlight a role of apoptosis as a mediator of tumor suppression in the irradiated thyroid or hematopoietic/lymphoid tissues as an example of radiation-induced mechanisms that restrain the growth or eliminate aberrant cells. The repertoire of tumor suppressive mechanisms includes cell cycle arrest, cellular senescence, apoptosis and other molecularly-defined modes of cell death  as well as maintaining genome stability. These processes are regulated by separate but intertwined pathways utilized in a cell type-specific manner. In regard to apoptosis, “BCL-2-regulated” (also termed “intrinsic”, “mitochondrial” or “stress-induced”) signaling pathway (Fig. 1) may be activated in both irradiated thyroid and hematopoietic tissues whereas cell surface “death receptor” signaling pathway (Fig. 1) may be activated only in hematopoietic/lymphoid tissues. Mutations in FAS and its ligand FASL may lead to lymphadenopathy and leukemia observed in Chornobyl cleanup workers. Control of apoptosis and progression of the cell cycle are linked processes. This is exemplified by a dual role of several proteins associated with radiation-induced thyroid carcinogenesis (Table 3). The partner genes in fusion genes, CLIP2 and their first neighbors are essential for proper chromosome segregation, cytokinesis and the regulation of microtubule dynamics. Dysregulation of these processes leads to improper chromosome segregation in cell division and, in turn, mitotic catastrophe or apoptosis. The importance of the MAPK pathway, which plays a fundamental role in proliferation, has been well established in Chornobyl thyroid tumors with rearrangements of the RET, BRAF and NTRK genes, and CLIP2 amplification as well as in Chornobyl leukemia in Ukrainian patients. RET/PTC1 affects the activity of NF-κB via association of CCDC6 with phosphatase PP4C (Fig. 2). Normally, NF-κB drives cellular proliferation but also promotes cell survival in part via transcriptional induction of anti-apoptotic BCL-2 family members (BCL-2 and BCL-XL) as well as several IAPs (Fig. 1). The IAP member survivin, known as the fourth most highly expressed protein in human cancer , shares functionality with CLIP2. Like CLIP2, survivin localizes to the mitotic spindle by interaction with tubulin during mitosis but unlike CLIP2 it also plays a contributing role in regulating apoptosis in G2/M phase. The overexpression of survivin in cancer may overcome this apoptotic checkpoint and favor aberrant progression of transformed cells through mitosis. 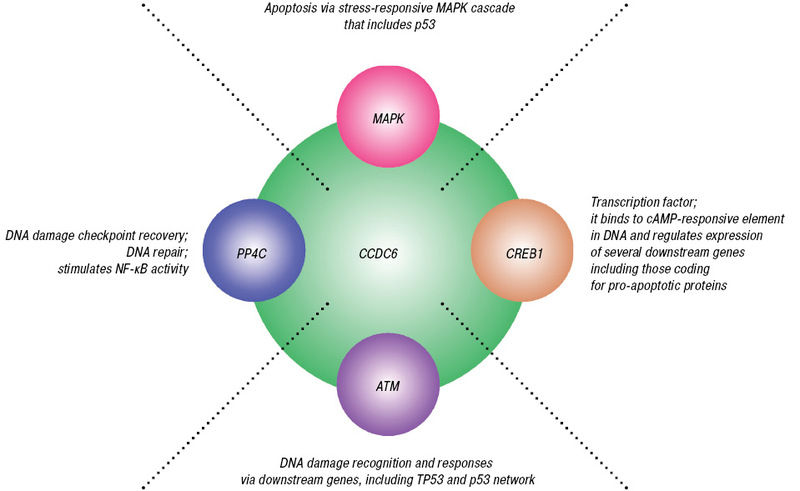 Survivin expression can be deregulated in cancer by several mechanisms, including amplification of the survivin locus on chromosome 17q25 and increased upstream signaling in the MAPK or phosphatidylinositol 3-kinase pathways. The identification of somatic mutations and the cancer genes that they alter has been a central aim of cancer research in radiation biology for more than a half of a century. In the case of thyroid cancer, the search for “the radiation signature” is greatly facilitated by the resources of the Chernobyl Tissue Bank, which systematically collects biological samples from tumors and normal tissues from patients with radiation-related thyroid pathology. Perhaps the most important finding to date, possibly generalizable to other tissues, is that the type of mutations due to DNA double strand breaks (gene fusion and amplification) is the initial signature event in radiation-induced tumors; this is in contrast to spontaneous tumors that typically harbor point mutations (base substitutions, small deletions and insertions). For clarity, point mutations — hitting a specific nucleotide base by chance — are highly improbable (the event probability of the order of 10–9) considering the physical size of the human genome and random pattern/density of ionizations impinging on DNA. This is nicely illustrated by pathological and genetic analyses of Fukushima thyroid cancers showing high frequency of BRAFV600E mutation and background levels of chromosome rearrangements, consistent with non-radiogenic etiology . In conclusion, studies of populations exposed to radiation as the result of the Chornobyl accident provided increased knowledge of the molecular pathogenesis of thyroid tumors following exposure to iodine isotopes. Recent studies among Chornobyl liquidators have also provided evidence of increases in the risk of leukemia and other hematopoietic malignancies. Upward trends have been reported, often anecdotally, of increases in a variety of other tumors in those exposed to Chornobyl fallout (Table 4), including breast, brain and kidney. The progress to date has been possible because of past and on-going efforts of many experts from within and outside the most affected areas who worked to evaluate the radiological impact of the catastrophe over the first thirty years post Chornobyl. There is, however, much work to be done over the next years and even decades. In a manner similar to life-span studies of the atomic bomb survivors, the coordinate multidisciplinary work needs to continue internally to monitor sensitive populations such as young women at a risk of breast cancer, to maximize use of resources such as Chernobyl Tissue Bank and minimize duplication of efforts such as microarray studies. With further technological advances in transcriptomic, proteomic, and metabolomic profiling we can realistically expect to elucidate central questions related to the nature of human radiation carcinogenesis in a near future. Research by one of us (EKBK) was supported by the Department of Radiation Oncology, the University of Maryland Medical System, and the University of Maryland School of Medicine. UNSCEAR. United Nation Scientific Committee on the Effects of Atomic Radiation. Sources, effects, and risks of ionizing radiation (Appendix D). New York, United Nations, 1988: 309–74. UNSCEAR. United Nation Scientific Committee on the Effects of Atomic Radiation. Sources, effects, and risks of ionizing radiation (Appendix D). New York, United Nations, 2008: 45–219. Saenko V, Ivanov V, Tsyb A, et al. The Chernobyl accident and its consequences. Clin Oncol 2011; 23: 234–43. Balonov MI. The Chernobyl Forum: major findings and recommendations. J Environ Radioact 2007; 96: 6–12. World Health Organization. Health effects of Chernobyl accident and special health care programmes. Report of the UN Chernobyl Forum Expert Group «Health». Bennett B, Repocholi M, Carr Z (Eds). Geneva, Switzerland, 2006: 31. Kortov V, Ustyantsev Yu. Chernobyl accident: causes, consequences, and problems of radiation measurements. Radiat Meas 2013; 55: 12–6. Upton AC. Historical perspective on radiation carcinogenesis. In: Radiation Carcinogenesis. Upton AC, Alber RE, Burns FJ, Shore RE (Eds). Elsevier: New York, USA, 1986: 1–10. Health Risks from Exposure to Low Levels of Ionizing Radiation: BEIR VII Phase 2. The National Academic Press: Washington, USA, 2006: 141–54. Hall EJ, Giaccia AJ. Radiation carcinogenesis. In: Radiobiology for the Radiologist — 7th Edition. Lippincott Williams & Wilkins: Philadelphia, USA, 2012: 135–58. Vogelstein B, Fearon ER, Hamilton SR, et al. Genetic alterations during colorectal-tumor development. N Eng J Med 1988; 319: 525–32. The International Cancer Genome Consortium, Hudson TJ, Anderson W, Artez A, et al. International network of cancer genome projects. Nature 2010; 464: 993–8. Forbes SA, Beare D, Gunasekaran P, et al. COSMIC: exploring the world’s knowledge of somatic mutations in human cancer. Nucleic Acids Res 2015; 43 (Database issue): D805–11. Vogelstein B, Papadopoulos N, Velculescu VE, et al. Cancer genome landscapes. Science 2015; 339: 1546–58. Friedewald WF, Rous P. The initiating and promoting elements in tumor production: an analysis of the effects of tar, benzpyrene, and methylcholanthrene on rabbit skin. J Exp Med 1944; 80: 101–26. Watson JD, Crick FH. Molecular structure of nucleic acids: a structure for deoxyribose nucleic acid. Nature 1953; 171: 737–8. Krontiris TG, Cooper GM. Transforming activity of human tumor DNAs. Proc Natl Acad Sci U S A 1981; 78: 1181–4. Reddy EP, Reynolds RK, Santos E, Barbacid M. A point mutation is responsible for the acquisition of transforming pro­perties by the T24 human bladder carcinoma oncogene. Nature 1982; 300: 149–52. Loeb LA, Harris CC. Advances in chemical carcinogenesis: a historical review and prospective. Cancer Res 2008; 68: 6863–72. Rowley JD. A new consistent chromosomal abnorma­lity in chronic myelogenous leukemia identified by quinacrine fluorescence and Giemsa staining. Nature 1973; 243: 290–3. Nowell P, Hungerford D. A minute chromosome in human granulocytic leukemia. Science 1960; 132: 1497. Schwab M. Oncogene amplification in solid tumors. Semin Cancer Biol 1999; 9: 319–25. Mondello C, Smirnova A, Giulotto E. Gene amplification, radiation sensitivity and DNA double-strand breaks. Mutat Res 2010; 704: 29–37. Albertson DG, Collins C, McCormick F, Gray JW. Chromosome aberrations in solid tumors. Nat Genet 2003; 34: 369–76. Nicholson JM, Cimini D. Cancer karyotypes: survival of the fittest. Front Oncol 2013; 3: 148. Roschke AV, Rozenblum E. Multi-layered cancer chromosomal instability phenotype. Front Oncol 2013; 3: 302. Galluzzi L, Vitale I, Abrams JM, et al. Molecular definitions of cell death subroutines: recommendations of the Nomenclature Committee on Cell Death 2012. Cell Death Differ 2012; 19: 107–20. Lavrik IN. Systems biology of death receptor networks: live and let die. Cell Death Dis 2014; 5: e1259. Mehlen P, Tauszig-Delamasure S. Dependence receptors and colorectal cancer. Gut 2014; 63: 1821–9. Fombonne J, Bissey PA, Guix C, et al. Patched dependence receptor triggers apoptosis through ubiquitination of caspase-9. Proc Natl Acad Sci U S A 2012; 109: 10510–5. Pradelli LA, Bénéteau M, Ricci JE. Mitochondrial control of caspase-dependent and -independent cell death. Cell Mol Life Sci 2010; 67: 1589–97. Appelqvist H, Wäster P, Kågedal K, Öllinger K. The lysosome: from waste bag to potential therapeutic target. J Mol Cell Biol 2013; 5: 214–26. Bhola PD, Letai A. Mitochondria — judges and executioners of cell death sentences. Mol Cell 2016; 61: 695–704. Chen HC, Kanai M, Inoue-Yamauchi A, et al. An interconnected hierarchical model of cell death regulation by the BCL-2 family. Nat Cell Biol 2015; 17: 1270–81. Philchenkov A, Miura K. The IAP protein family, SMAC mimetics and cancer treatment. Crit Rev Oncogen 2016; 21: 185–202. Chen J. The cell-cycle arrest and apoptotic functions of p53 in tumor initiation and progression. Cold Spring Harb Perspect Med 2016; 6: a026104. Doctor KS, Reed JC, Godzik A, Bourne PE. The apoptosis database. Cell Death Differ 2003; 10: 621–33. Li J, Tian H, Yang J, Gong Z. Long noncoding RNAs regulate cell growth, proliferation, and apoptosis. DNA Cell Biol 2016; 35: 459–70. Wong RS. 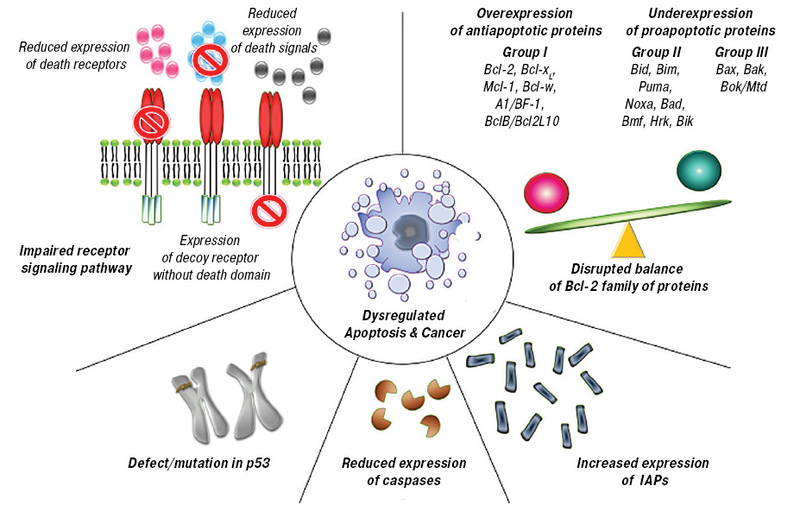 Apoptosis in cancer: from pathogenesis to treatment. J Exp Clin Cancer Res 2011; 30: 87. Abramenko IV, Philchenkov AA. Evaluation of apoptotic parameters in the diagnosis of cancer, its prognosis and optimal therapy. Vopr Onkol 2003; 49: 21–30 (in Russian). Miura K, Fujibuchi W, Ishida K, et al. Inhibitor of apoptosis protein family as diagnostic markers and therapeutic targets of colorectal cancer. Surg Today 2011; 41: 175–82. Cakir E, Yilmaz A, Demirag F, et al. Prognostic significance of micropapillary pattern in lung adenocarcinoma and expression of apoptosis-related markers: caspase-3, bcl-2, and p53. APMIS 2011; 119: 574–80. Bose P, Klimowicz AC, Kornaga E, et al. Bax expression measured by AQUAnalysis is an independent prognostic marker in oral squamous cell carcinoma. BMC Cancer 2012; 12: 332. Saggioro FP, Neder L, Stávale JN, et al. Fas, FasL, and cleaved caspases 8 and 3 in glioblastomas: a tissue microarray-based study. Pathol Res Pract 2014; 210: 267–73. Sah NK, Seniya C. Survivin splice variants and their diagnostic significance. Tumour Biol 2015; 36: 6623–31. Javid J, Mir R, Julka PK, et al. Extracellular cytochrome c as a biomarker for monitoring therapeutic efficacy and prognosis of non-small cell lung cancer patients. Tumour Biol 2015; 36: 4253–60. Brenner AV, Tronko MD, Hatch M, et al. I-131 dose response for incident thyroid cancers in Ukraine related to the Chernobyl accident. Environ Health Perspect 2011; 119: 933–9. Ivanov VK, Kashcheev VV, Yu S, et al. Radiation-epidemiological studies of thyroid cancer incidence in Russia after the Chernobyl accident (estimation of radiation risks, 1991–2008 follow-up period). Radiat Prot Dosimetry 2012; 151: 489–99. Zablotska LB, Ron E, Rozhko AV, et al. Thyroid cancer risk in Belarus among children and adolescents exposed to radioiodine after the Chernobyl accident. Br J Cancer 2011; 104: 181–7. Ron E, Lubin JH, Shore RE, et al. Thyroid cancer after exposure to external radiation: a pooled analysis of seven studies. Radiat Res 1995; 141: 259–77. Tsuda T, Tokinobu A, Yamamoto E, Suzuki E. Thyroid cancer detection by ultrasound among residents ages 18 years and younger in Fukushima, Japan: 2011 to 2014. Epidemiology 2016; 27: 316–22. Mitsutake N, Fukushima T, Matsuse M, et al. BRAFV600E mutation is highly prevalent in thyroid carcinomas in the young population in Fukushima: a different oncogenic profile from Chernobyl. Sci Rep 2015; 5: 16976. The Cancer Genome Atlas Research Network. Integrated genomic characterization of papillary thyroid carcinoma. Cell 2014; 159: 676–90. Demidchik YE, Saenko VA, Yamashita. Childhood thyroid cancer in Belarus, Russia, and Ukraine after Chernobyl and at present. Arq Bras Endocrinol Metabol 2007; 51: 748–62. Bogdanova TI, Zurnadzhy LY, Nikiforov YE, et al. Histopathological features of papillary thyroid carcinomas detected during four screening examinations of a Ukrainian-American cohort. Brit J Cancer 2015; 113: 1556–64. Suzuki K, Mitsutake N, Saenko V, Yamashita S. Radiation signatures in childhood thyroid cancers after the Chernobyl accident: possible roles of radiation in carcinogenesis. Cancer Sci 2015; 106: 127–33. Lundberg AS, Randell SH, Stewart SA, et al. Immorta­lization and transformation of primary human airway epithelial cells by gene transfer. Oncogene 2002; 21: 4577–86. Fusco A, Grieco M, Santoro M, et al. A new oncogene in human thyroid papillary carcinomas and their lymph-nodal metastasis. Nature 1987; 328: 170–2. Takahashi M. Structure and expression of the ret transforming gene. IARC Sci Publ 1988; (92): 189–97. Leeman-Neill RJ, Brenner AV, Little MP, et al. RET/PTC and PAX8/PPARγ chromosomal rearrangements in post-Chernobyl thyroid cancer and their association with iodine-131 radiation dose and other characteristics. Cancer 2013; 119: 1792–9. Ricarte-Filho JC, Li S, Garcia-Rendueles MER, et al. Identification of kinase fusion oncogenes in post-Chernobyl radiation-induced thyroid cancers. J Clin Invest 2013; 123: 4935–44. Kroll TG, Sarraf P, Pecciarini L, et al. PAX8-PPARgamma1 fusion oncogene in human thyroid carcinoma. Science 2000; 289: 1357–60. Rabes HM, Demidchik EP, Sidorow JD, et al. Pattern of radiation-induced RET and NTRK1 rearrangements in 191 post-Chernobyl papillary thyroid carcinomas: biological, phenotypic, and clinical implications. Clin Cancer Res 2000; 6: 1093–103. Klugbauer S, Demidchik EP, Lengfelder E, Rabes HM. Detection of a novel type of RET rearrangement (PTC5) in thyroid carcinomas after Chernobyl and analysis of the involved RET-fused gene RFG5. Cancer Res 1998; 58: 198–203. Salassidis K, Bruch J, Zitzelsberger H, et al. Translocation t(10;14)(q11.2;q22.1) fusing the Kinectin to the RET gene creates novel rearranged form (PTC8) of the RET proto-oncogene in radiation-induced childhood papillary thyroid carcinoma. Cancer Res 2000; 60: 2786–9. Ciampi R, Knauf JA, Kerler R, et al. Oncogenic AKAP9-BRAF fusion is a novel mechanism of MAPK pathway activation in thyroid cancer. J Clin Invest 2005; 115: 94–101. Cordioli MICV, Moraes L, Carvalheira G, et al. AGK-BRAF gene fusion is a recurrent event in sporadic pediatric thyroid carcinoma. Cancer Med 2016; 5: 1535–41. Puxeddu E, Zhao G, Stringer JR, et al. Characterization of novel non-clonal intrachromosomal rearrangements between H4 and PTEN genes (H4/PTEN) in human thyroid cell lines and papillary thyroid cancer specimens. Mut Res 2005; 570: 17–32. Leeman-Neill RJ, Kelly LM, Liu P, et al. ETV6-NTRK3 is a common chromosomal rearrangement in radiation-associated thyroid cancer. Cancer 2014; 120: 799–807. Fenton CL, Lukes Y, Nicholson D, et al. The ret/PTC mutations are common in sporadic papillary thyroid carcinoma of children and young adults. J Clin Endocrinol Metab 2000; 85: 1170–5. Powell N, Jeremiah S, Morishita M, et al. Frequency of BRAF T1796A mutation in papillary thyroid carcinoma relates to age of patient at diagnosis and not to radiation exposure. J Pathol 2005; 205: 558–64. Unger K, Zitzelsberger H, Salvatore G, et al. Heterogeneity in the distribution of RET/PTC rearrangements within individual post-Chernobyl papillary thyroid carcinomas. J Clin Endocrinol Metab 2004; 89: 4272–9. Hess J, Thomas G, Braselmann H, et al. Gain of chromosome band 7q11 in papillary thyroid carcinomas of young patients is associated with exposure to low-dose irradiation. Proc Natl Acad Sci U S A 2011; 108: 9595–600. Balcer-Kubiczek EK. The role of the apoptotic machinery in ionizing radiation-induced carcinogenesis. Crit Rev Oncogen 2016; 21: 169–84. Santoro M, Chiappetta G, Cerrato A, et al. Development of thyroid papillary carcinomas secondary to tissue-specific expression of the RET/PTC1 oncogene in transgenic mice. Oncogene 1996; 12: 1821–6. Jhiang SM, Cho JY, Furminger TL, et al. Thyroid carcinomas in RET/PTC transgenic mice. Recent Results Cancer Res 1998; 154: 265–70. Selmansberger M, Feuchtinger A, Zumadzhy L, et al. CLIP2 as radiation biomarker in papillary thyroid carcinoma. Oncogene 2015; 34: 3917–25. Selmansberger M, Kaiser JC, Hess J, et al. Dose-dependent expression of CLIP2 in post-Chernobyl papillary thyroid carcinomas. Carcinogenesis 2015; 36: 748–56. Abend M, Pfeiffer RM, Ruf C, et al. Iodine-131 dose dependent gene expression in thyroid cancers and corresponding normal tissues following the Chernobyl accident. PLos One 2012; 7: e39103. Chernobyl Tissue Bank [homepage on the Internet]. London: Imperial College London [cited 2016 Nov 2]. Available from: http://www.chernobyltissuebank.com. Ameziane-El-Hassani R, Boufraqech M, Lagente-Chevallier O, et al. Role of H2O2 in RET/PTC1 chromosomal rearrangements produced by ionizing radiation in human thyroid cells. Cancer Res 2010; 70: 4123–32. Latysheva NS, Babu MM. Discovering and understanding oncogenic gene fusions through data intensive computational approaches. Nucleic Acids Res 2016; 44: 4487–503. Kumar-Sinha C, Kalyana-Sundaram S, Chinnaiyan AM. Landscape of gene fusions in epithelial cancers: seq and ye shall find. Genome Med 2015; 7: 129. GeneCards®: The Human Gene Database [database on the Internet]. [Cited 2016 Nov 2]. Available from: http://www.genecards.org. National Center for Biothechnology Information, U.S. National Library of Medicine [database on the Internet]. [Cited 2016 Nov 2]. Available from: http://www.ncbi.nlm.nih.gov/gene. Pavlopoulos GA, Promponas VJ, Ouzounis CA, Iliopoulos I. Biological information extraction and co-occurrence analysis. Methods Mol Biol 2014; 1159: 77–92. Celetti A, Cerrato A, Merolla F, et al. H4(D10S170), a gene frequently rearranged with RET in papillary thyroid carcinomas: functional characterization. Oncogene 2004, 23: 109–21. Merolla F, Pentimalli F, Pacelli R, et al. Involvement of H4(D10S170) protein in ATM-dependent response to DNA damage. Oncogene 2007; 26: 6167–75. Merolla F, Luise C, Muller MT, et al. Loss of CCDC6, the first identified RET partner gene, affects pH2AX S139 levels and accelerates mitotic entry upon DNA damage. PLoS One 2012; 7: e36177. Hatakeyama S. TRIM proteins and cancer. Nat Rev Cancer 2011; 11: 792–804. Dinets A, Hulchiy M, Sofiadis A, et al. Clinical, genetic, and immunohistochemical characterization of 70 Ukrainian adult cases with post-Chornobyl papillary thyroid carcinoma. Eur J Endocrinol 2012; 166: 1049–60. Delys L, Detours V, Franc B, et al. Gene expression and the biological phenotype of papillary thyroid carcinomas. Oncogene 2007; 26: 7894–903. Xu Y, Deng Y, Ji Z, et al. Identification of thyroid carcinoma related genes with mRMR and shortest path approaches. PLoS One 2014; 9: e94022. Hébrant A, Dom G, Dewaele M, et al. mRNA expression in papillary and anaplastic thyroid carcinoma: molecular anatomy of a killing switch. PLoS One 2012; 7: e37807. Dom G, Tarabichi M, Unger K, et al. A gene expression signature distinguishes normal tissues of sporadic and radiation-induced papillary thyroid carcinomas. Br J Cancer 2012; 107: 994–1000. Handkiewicz-Junak D, Świerniak M, Rusinek D, et al. Gene signature of the post-Chernobyl papillary thyroid cancer. Eur J Nucl Med Mol Imaging 2016; 43: 1267–77. Jarząb B, Wiench M, Fujarewicz K, et al. Gene expression profile of papillary thyroid cancer: sources of variability and diagnostic implications. Cancer Res 2005; 65: 1587–97. Kyoto Encyclopedia of Genes and Genomes [database on the Internet]. [Cited 2016 Nov 2]. Available from: http://www.kegg.jp. Wang HQ, Zhang HY, Hao FJ, et al. Induction of BAG2 protein during proteasome inhibitor-induced apoptosis in the thyroid carcinoma cells. Br J Pharmacol 2008; 155: 655–60. Teider N, Scott DK, Neiss A, et al. Neuralized1 causes apoptosis and downregulates Notch target genes in medulloblastoma. Nuero Oncol 201; 12: 1244–56. Vollrath B, Pudney J, Asa S, et al. Isolation of a murine homologue of the Drosophila neuralized gene, a gene required for axonemal integrity in spermatozoa and terminal maturation of the mammary gland. Mol Cell Biol 2001; 21: 7481–94. Henshaw PS, Hawkins JW. Incidence of leukemia in physicians. J Natl Cancer Inst 1944; 4: 339–46. Hsu WL, Preston DL, Soda M, et al. The incidence of leukemia, lymphoma and multiple myeloma among atomic bomb survivors: 1950–2001. Radiat Res 2013; 179: 361–82. Krestinina LY, Davis FG, Schonfeld S, et al. Leukaemia incidence in the Techa River Cohort: 1953–2007. Br J Cancer 2013; 109: 2886–93. Shilnikova NS, Preston DL, Ron E, et al. Cancer mortality risk among workers at the Mayak nuclear complex. Radiat Res 2003; 159: 787–98. Liu JJ, Freedman DM, Little MP, et al. Work history and mortality risks in 90,268 US radiological technologists. Occup Environ Med 2014; 71: 819–35. Preston DL, Kusumi S, Tomonaga M, et al. Cancer incidence in atomic bomb survivors. Part III. Leukemia, lymphoma and multiple myeloma, 1950–1987. Radiat Res 1994; 137 (2 Suppl): S68–97. Zablotska LB, Bazyka D, Lubin JH, et al. Radiation and the risk of chronic lymphocytic and other leukemias among Chornobyl cleanup workers. Environ Health Perspect 2013; 121: 59–65. Silver SR, Hiratzka SL, Schubauer-Berigan MK, Daniels RD. Chronic lymphocytic leukemia radiogenicity: a systematic review. Cancer Causes Control 2007; 18: 1077–93. Hamblin TJ. Have we been wrong about ionizing radiation and chronic lymphocytic leukemia? Leuk Res 2008; 32: 523–5. Gluzman DF, Sklyarenko LM, Ivanivska TS, et al. Chronic lymphocytic leukemia and ionizing radiation. Onco­logy (Kyiv) 2016; 18: 84–92 (in Russian). Bazyka D, Gudzenko N, Dyagil I, et al. Chronic lymphocytic leukemia in Chornobyl cleanup workers. Health Phys 2016; 111: 186–91. Ivanov VK, Tsyb AF, Khait SE, et al. Leukemia incidence in the Russian cohort of Chernobyl emergency workers. Radiat Environ Biophys 2012; 51: 143–9. Rozhko AV, Nadyrov EA, Veyalkin IV, et al. Medical effects of Chernobyl disaster in the Republic of Belarus: 30 years after. Med Biol Probl Life Act 2016; (1): 31–42 (in Russian). Bazyka DA, Gudzenko NA, Dyagil IS, et al. Multiple myeloma among Chornobyl accident clean-up workers — state and perspectives of analytical study. Probl Radiac Med Radiobiol 2013; (18): 169–72. Gluzman DF, Sklyarenko LM, Koval SV, et al. Myelodysplastic syndromes in Chernobyl clean-up workers. Ann Hematol 2015; 94: 1639–43. Davis S, Day RW, Kopecky KJ, et al. Childhood leukaemia in Belarus, Russia, and Ukraine following the Chernobyl power station accident: results from an international collaborative population-based case-control study. Int J Epidemiol 2006; 35: 386–96. Hatch M, Ostroumova E, Brenner A, et al. Non-thyroid cancer in Northern Ukraine in the post-Chernobyl period: short report. Cancer Epidemiol 2015; 39: 279–83. Ostroumova E, Hatch M, Brenner A, et al. Non-thyroid cancer incidence in Belarusian residents exposed to Chernobyl fallout in childhood and adolescence: Standardized Incidence Ratio analysis, 1997–2011. Environ Res 2016; 147: 44–9. Yablokov AV, Nesterenko VB, Nesterenko AV, Preobrazhenskaia NE. Chernobyl: consequences of the catastrophe for people and the environment. Moscow: KMK Scientific Press Ltd., 2016. 826 p.
Klymenko SV, Ilyenko IN, Golarnik NA, et al. Membrane transport and apoptosis-related proteins in radiation-associated acute myeloid leukemia following the Chornobyl accident. Gen Physiol Biophys 2009; 28: 63–9. Savli H, Gluzman DF, Sunnetci D, et al. Quantitative real time PCR analysis of apoptosis-related gene expression in leukemias in Ukrainian patients. Exp Oncol 2011; 33: 104–6..
Burke BA, Carroll M. BCR–ABL: a multi-faceted promoter of DNA mutation in chronic myelogeneous leukemia. Leukemia 2010; 24: 1105–12. Deming PB, Schafer ZT, Tashker JS, et al. Bcr-Abl-mediated protection from apoptosis downstream of mitochondrial cytochrome c release. Mol Cell Biol 2004; 24: 10289–99. Klymenko SV, Misharina ZhA, Abramenko IV, et al. Determination of BCR/ABL translocation in radiation-associated acute myeloid leukemia patients by fluorescence in situ hybridization. Tsitol Genet 2005; 39(6): 55–9 (in Ukrainian). Butenko ZA, Smirnova IA, Zavelevich MP, et al. Molecular genetic aspects of leukemogenesis and apoptosis. In: Ways and Prospects of Experimental Oncology in Ukraine. Kyiv: DIA, 2001: 25–34 (in Ukrainian). Ilyenko I, Lyaskivska O, Bazyka D. Analysis of relative telomere length and apoptosis in humans exposed to ionising radiation. Exp Oncol 2011; 33: 235–8. Reste J, Zvigule G, Zvagule T, et al. Telomere length in Chernobyl accident recovery workers in the late period after the disaster. J Radiat Res 2014; 55: 1089–100. Cellini F, Morganti AG, Genovesi D, et al. Role of microRNA in response to ionizing radiations: evidences and potential impact on clinical practice for radiotherapy. Molecules 2014; 19: 5379–401. Naito Y, Oue N, Pham TT, et al. Characteristic miR-24 expression in gastric cancers among atomic bomb survivors. Pathobiology 2015; 82: 68–75. Zhang H, Duan J, Qu Y, et al. Onco-miR-24 regulates cell growth and apoptosis by targeting BCL2L11 in gastric cancer. Protein Cell 2016; 7: 141–51. Abend M, Azizova T, Müller K, et al. Gene expression analysis in Mayak workers with prolonged occupational radiation exposure. Health Phys 2014; 106: 664–76. Anastasov N, Höfig I, Vasconcellos IG, et al. Radiation resistance due to high expression of miR-21 and G2/M checkpoint arrest in breast cancer cells. Radiat Oncol 2012; 7: 206. Velculescu VE, Madden SL, Zhang L, et al. Analysis of human transcriptomes. Nat Genet 1999; 23: 387–8.